It’s July and the temperatures have been rising…and rising…and rising. How about forgetting the heat with a scrumptious hot fudge sundae? But before you dig in, let’s take a moment to appreciate the human ingenuity over five millenia that brought you the cooling cream and rich chocolate sauce of this very ancient confection. The origins of ice cream most likely begin with ice that was flavored with fruit and essences by the ancient Chinese around 3000 BCE. Later references tell us that the Roman emperor Nero (37-68 CE) ordered ice brought from the mountains and garnished with fruit toppings. King Tang (618-697 CE) of Shang, China was reported as having a method for creating ice and milk treats. Popular lore says that Marco Polo brought the iced concoction to Italy after enjoying it in China, although there is no substantiation for this (nor for pasta either, by the way). Today’s ice cream is a product of people over the centuries improving on the original. During the 17th century Italy added the ingredients that created the dessert we enjoy today. In fact, the term “iced cream,” which was made by cooling sweet cream or egg-based puddings, was first found in print in 1688 according to the Oxford English Dictionary. France’s version, which spread northward through Europe, used egg yolks, while the version that jumped the pond to America used no eggs or egg whites only. Here it was a favorite of such early luminaries as presidents George Washington and Thomas Jefferson and First Lady Dolly Madison. Want more on the timeline of ice cream? Click here. Cacao beans. Image courtesy of Imagicity.com. Chocolate, or “xocoatl” to the ancient Aztecs, was a bitter drink from the cacao bean. The importance of the cacao tree is revealed by its Aztec name Theobroma cacao, which means “food of the gods.” While we don’t know exactly how long chocolate has been a revered drink by Mesoamericans, Sophie and Michael Coe in The True History of Chocolate propose there is linguistic evidence that it could be three or four thousand years, reaching back to pre-Columbian cultures such as the Olmec. University of Pennsylvania anthropologists recently discovered cacao remains on pottery excavated in Honduras that could be from 1400 BCE. Cacao beans were so valued that they were circulated as currency, as a 16th-century Aztec document describes. Both the Mayas and their later conquerors the Aztecs thought the bean had mystical or divine properties and used them in their rituals. The idea of sweetening chocolate with honey or sugar came from the conquistadors who found the bitterness of the Aztec drink unpalatable. It is said that the Aztec king Montezuma served the Spanish explorer Hernando Cortes a repast that included chocolate. Montezuma had first thought Cortes to be a reincarnated deity rather than the conqueror who would open the floodgates to the conquistadors that followed. Once introduced to Spain, chocolate became a widely popular, fashionable drink among the wealthy thought to have nutritious, medical and even aphrodisiac benefits. Not until the invention of the steam engine that made mass production possible was chocolate able to be enjoyed by the masses. Today, chocolate is an important ingredient in hundreds of recipes. Who knew a little bean could come so far? The exact history of how whipped cream came into popular use is unknown. Conjecture is that it was accidentally discovered when someone, most likely living in a cool climate, was making butter and being in a hurry, whipped it rather than churned it. Another version has it being the result of containers of cream jostled by a rider on a fast horse—voila, whipped cream! Whatever its origins we do know that it is recorded that the famous French chef Vatel served sweetened whipped cream at a reception for King Louis the XIV in 1661. Vatel was the maitre d’hotel at the Chateau de Chantilly at the time and unfortunately, being the consummate chef that he was, committed suicide later that night because he worried his fish would be served late. He never lived to see crème a la Chantilly gain the popularity it has today. 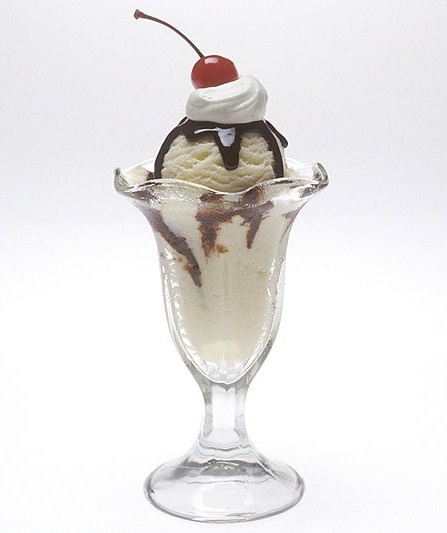 One of the first sundae recipes was published in the Modern Guide for Soda Dispensers in 1897 in the United States. While there is no definitive timeline for the sundae’s origins (although many towns even today claim that sweet piece of history), it is generally thought that sundaes were created to skirt the Sunday Blue Laws that in many states prohibited the selling of soda water on Sundays. The result? No ice cream sodas, a very popular treat of the day. But take out the soda water, and what’s left? The sundae (with a clever turn of letter by some obviously pro-soda water wag). So that’s how the hot fudge sundae became such a sensation. Now all you have to do is get out the ingredients in the recipes below, make a homemade batch of ice cream and fudge (we’ll leave the whipped cream for you to figure out. Hint: whip heavy cream until it peaks and add sugar and a splash of vanilla; cherry optional) and sit back and enjoy 5,000 years of history. This outstanding vanilla bean ice cream recipe is a custard ice cream infused with three vanilla beans, more than most recipes call for. This makes it an expensive treat – but what a treat! The other unusual ingredients here are the dry milk and raw sugar, which enhance the strong vanilla flavor. Warm the milk and cream in a medium saucepan until it is hot, but not simmering. With a sharp knife, slice down the length of each vanilla bean, spread them open and scrape the seeds out into the pan, then add the bean pods. Boil the milk then immediately reduce to a simmer. Simmer 10 minutes. Whisk egg yolks and sugar until light and foamy. Slowly pour the milk into the egg mixture, stirring to blend. Whisk in the milk powder. Pour entire mixture back into the saucepan and cook over medium heat until the custard thickens slightly and reaches about 70 C (160F). Strain custard through a sieve. Cover surface of custard with plastic wrap and chill overnight. In a heavy saucepan over medium low heat melt the chocolate and the coffee; once melted remove pan from heat and stir in the butter, cream, and cinnamon. This entry was posted in Blog, Culinary, Culture and tagged ancient history, AntiquityNOW, Aztecs, chocolate, ice cream, Mayas, Mesoamerica, sundae, whipped cream. Bookmark the permalink.